Apple and McDonald's will tell investors everything they need to know about the direction of the economy. BOSTON (TheStreet) -- Apple (AAPL - Get Report) and McDonald's (MCD - Get Report) stand out as the two most important companies to release third-quarter earnings this week because they're barometers of global consumer demand. Investors, already overwhelmed by Europe's dramatic debt saga, a deteriorating U.S. economy and a dive in the stock market, will face about a fifth of S&P 500 and almost half of Dow Jones Industrial Average members reporting financial results this week. The weakening financial industry probably will dominate headlines, with Occupy Wall Street and its offshoots protesting banks including Bank of America ( BAC - Get Report) and Citigroup ( C - Get Report). "The market is already prepared for disappointing numbers out of the banks, so nothing has changed," says Andrew Fitzpatrick, director of investments at Chicago-based Hinsdale Associates, a firm with $100 million in assets under management. 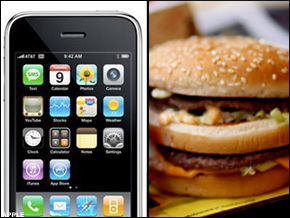 Apple, maker of the iPhone and iPad, and hamburger-restaurant chain McDonald's are "much more center stage," Fitzpatrick says. Apple, the world's largest company by market value, and McDonald's, the second-biggest employer after Wal-Mart ( WMT, have been "executing very well in terms of their operations. These companies seem to be above all the economic bumps in the road." There will be no shortage of interesting companies to follow. General Electric ( GE - Get Report), the largest diversified conglomerate in the world, is due to report Friday. Intel ( INTC - Get Report), set to report late Tuesday, makes chips for almost every conceivable electronic device. Microsoft ( MSFT, on Thursday's docket of releases, makes the operating system and software run by most companies in the world. However, investors are watching technology and consumer companies for clues about the direction of economies. Bill Stone, chief investment strategist with PNC Wealth Management, says Apple is the first choice for investors to watch. "When I glanced at the earnings calendar, the first name that popped off the page was Apple," Stone says of the gadget maker. "That's what you zone in on instantly and you have a hard time looking further than that." Stone, whose firm owns Apple shares, says the iPhone and iPad maker will be so important to investors because the company was able to sell these high-priced, high-margin products even when consumers were struggling in the recession. "Apple is in the spot where you can see how everyone else will do. You want to see if that juggernaut can continue," Stone says. Apple is at a junction after the Oct. 5 death of Steve Jobs, the co-founder and former CEO. Jobs had long been considered the driving force behind the company's innovation and rocketing share price, even though he groomed current CEO Tim Cook. Investors, though, don't seem overly concerned yet, as Apple's stock on Friday hit an all-time high. Apple always seems to exceed analysts' predictions, only to offer conservative guidance. Analysts already have high hopes, as Apple is said to have sold more than 4 million iPhone 4S handsets after the device went on sale Friday. "Apple has the innovation and products people have a desire for," Fitzpatrick says. "What's incredible is that the iPhone isn't even saturated yet. There are still a lot of users for it, and the market share is growing." Michael Sheldon, chief market strategist at RDM Financial, a Westport, Conn.-based firm with $650 million in assets, says he'd "like to hear about how their various products are doing in different parts of the world. Apple is just breaking through the surface in terms of sales in emerging markets." Sheldon also notes how Apple is in an important transitional period in terms of growth now that it is the largest company in the entire world by market cap, recently racing past Exxon Mobil ( XOM. It's now valued at almost $400 billion. "Historically, when most companies increase their market caps to such high levels, at some point growth stalls and slows," he says. "Wall Street is littered with companies that have crashed and burned after increasing their market cap to very high levels. The fact that Apple has kept up their growth rate at such high levels is truly amazing. That's why it's a must-own stock for so many investors." Like Apple, McDonald's is a truly global brand. The hamburger maker, which employs about 1.7 million people, has seen strong overseas sales. Hinsdale's Fitzpatrick says he expects more upside in McDonald's global sales, which could bolster other consumer stocks. "The interesting thing about McDonald's is that you get the global reach, so you see how it's doing in every region," PNC's Stone says in agreement, noting his firm owns shares of McDonald's. "It's like Wal-Mart from the standpoint where it's a trade-down" from higher-priced restaurants. RDM Financial's Sheldon says that while McDonald's is classified as a restaurant company, "we actually think of them more as a consumer-staples name because of its predictability and strong balance sheet." Sheldon says his firm owns shares of McDonald's because the company has generated strong free cash flow, has an attractive dividend yield and, despite high exposure to Europe, continues to post solid same-store sales numbers quarter after quarter. "That's pretty amazing," Sheldon says. The outlook is what investors will pay most attention to, and for that reason, Sheldon says it will be important for McDonald's not to rock the boat. "Whether it's consumer spending, commodity cost pressures, expansion plans, new product launches -- those are the areas investors will focus in on going forward," Sheldon adds. Besides Apple and McDonald's, gold and copper company Freeport-McMoRan's ( FCX - Get Report) outlook will be important, Fitzpatrick and Sheldon say. "The price of copper has been highly correlated to the economy," Fitzpatricks says. "So this report will go a long way in updating investors on the company and where they see the economy heading based on copper." Sheldon also finds importance in railroad operator Union Pacific ( UNP and energy companies Halliburton ( HAL and Schlumberger ( SLB. "There are so many different angles this week," he adds. "There is something for everybody."